Is there any widely accepted and understood maybe colloquial term other than Zehncentstück? Are there regional differences either in Germany or in Switzerland, Austria, and other German speaking regions outside of Germany? Regarding this article there are several words in use to name the 10-Cent coin. The article point out, that the word Groschen is still in use after changing from D-Mark to Euro. Another often used word seems to be Zehner. This article based on a survey (its the answer to question 2a of whatever; I tried to find the appropriate question, but failed), but I do not believe the full correctness of this article. The map on top of the page shows me, that West Germany use commonly Zehner and Groschen, but I can't remember when I heard it last (Groschen) and Zehner is in my understanding 10 Euro. Funny enough it's the other way around. Before we had cents in Germany there was the name "Groschen" for the Zehnpfennigstück. This also produced nice words like "Groschengrab" which was used for gambling machines and parking meters. I haven't heard that word for a while. 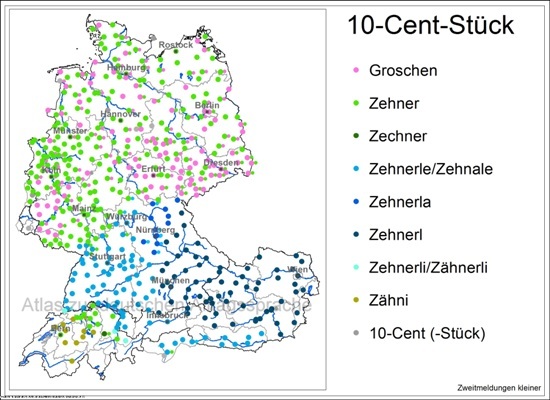 Since we use cents in Germany I have never heard of a special name for the 10-cent-coin. Looks like neither "Groschen" nor "dime" was adopted for it. In Austria, I have heard dimmiutives for the Cent coins: Einserl, Zweierl, Fünferl, Zehnerl, Zwanzgerl, Fufzgerl. This use is consistent with the pre-Euro usage, where the same dimmiutives would be used for the respective Groschen values (i.e. a 1995 Zehnerl would be 10 Groschen ~ 1.3 Cent). I do know that the Germans used "Groschen" for the 10 Pfenning coin, but I have not heard this appropriated to the 10 or 5 Cent coin. And even if, Austrians wouldn't use this, having a former currency where the Groschen was a real subdivision. As for Switzerland: I do suspect that they don't have too much need for a Cent-label, having a different currency anyway. The only thing I know of is "Zehner", the same goes for the 20ct ("Zwanziger") and 50ct ("Fünfziger"). The only problem is, that the same works for 10€, 20€ and 50€, so the real meaning comes from the context. As @nd01 already mentioned, we do have a different currency (swiss franc). The corresponding counterpart to the cents in Germany would be Rappen in Switzerland. For the other coins worth less than one franc (5,10,20 and 50 Rappen), the terms are analogue to the above mentioned. Not the answer you're looking for? Browse other questions tagged single-word-request regional colloquial or ask your own question. What are German words like Handy and Homeoffice called? Is there a german equivalent for 'prepper'? Is there a German equivalent for the concept of “Flâneur”? German word for “awesome” sounding like “ga-yeah”? Is there a German “Loot Box”? Is there a German word for “graffiti”?